Bougainvillea consists of 14 tropical and subtropical species that grow as a woody, evergreen and shrubby vine. It can grow up to 20 feet high and wide, with stiff thorns on the stems and colored flowers. Some cultivars are difficult to grow from cuttings or seeds as they have little chlorophyll in their leaves. Others simply have fragile root systems. With the right knowledge, you can graft these cultivars onto stronger cultivars to make robust plants. 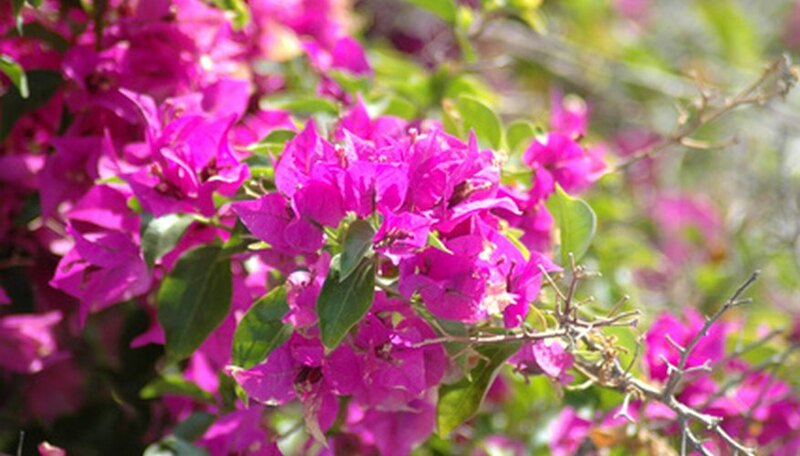 Obtain a bougainvillea scion and rootstock. The rootstock will provide a root system and should come from an established bougainvillea plant or seedling. The scion is the top of the plant. Choose the scion from the variety you wish to grow with a trunk about the same diameter as the rootstock. Find a scion free from disease. Prepare the scion and rootstock. Cut the scion plant a few inches above ground level with a sharp knife. Wrap moist paper towels around the cut end until you are ready to graft. Cut the rootstock about 5 or 6 inches above the ground, removing any shoots below that point. Make a 2 1/2 inch long sloping cut on both the scion and the rootstock so that when placed together the scion sits straight. On the scion, make a straight downward slit a little less than an inch from the tip. Make a matching one on the rootstock so that the two cuts slip into one another. Spread grafting wax on all cut areas of the graft. This will both keep out excess water and prevent drying. Wrap the grafted area with rubber budding strips to keep the scion and the rootstock together. Do not wrap too tight. Put the grafted plant in a humid area and watch the graft. Unwrap the rubber strips and inspect the wax for cracks. Reapply the wax if you see damage. Make your cuts with one stroke. Care for the grafted bougainvillea carefully for the first two to three years after grafting.